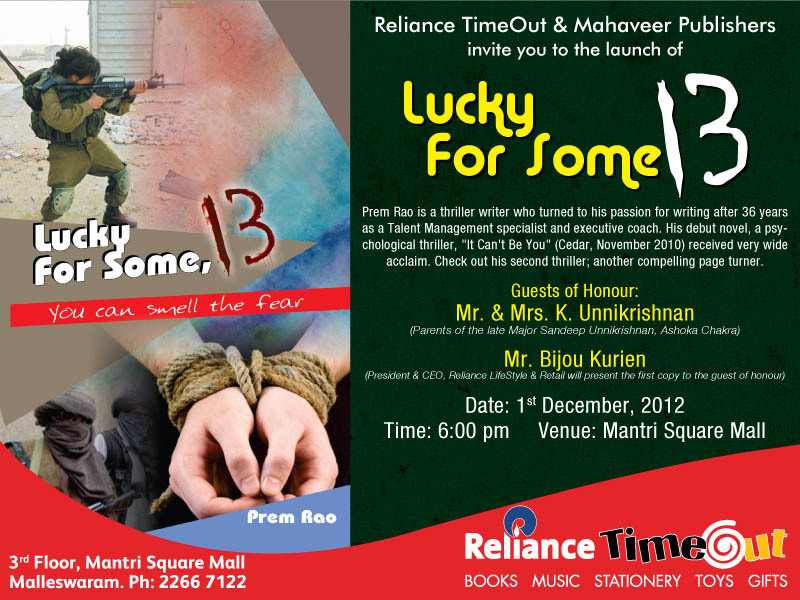 I am delighted that the invitation to the launch of my second thriller, “Lucky For Some, 13” has been released by Reliance TimeOut. The Guests of Honour will be Mr. & Mrs. Unnikrishnan, parents of the late Major Sandeep Unnikrishnan, Ashoka Chakra. This will be on December 1, 2012 at Reliance TimeOut @Mantri Square. In the meanwhile, as is the norm these days, on line sales are on, pardon the pun! It was very gratifying to see that LFS13 ranks #1 among the “New Releases” in Amegabooks, where it is still available for a very reasonable Rs. 98/- Really, at that price, it is a steal!